Here are some tips on driving in the snow and cold weather. A second weather system — like the one that came through Seattle on Sunday and Monday, blanketing the region with snow — appears likely to arrive later Friday. 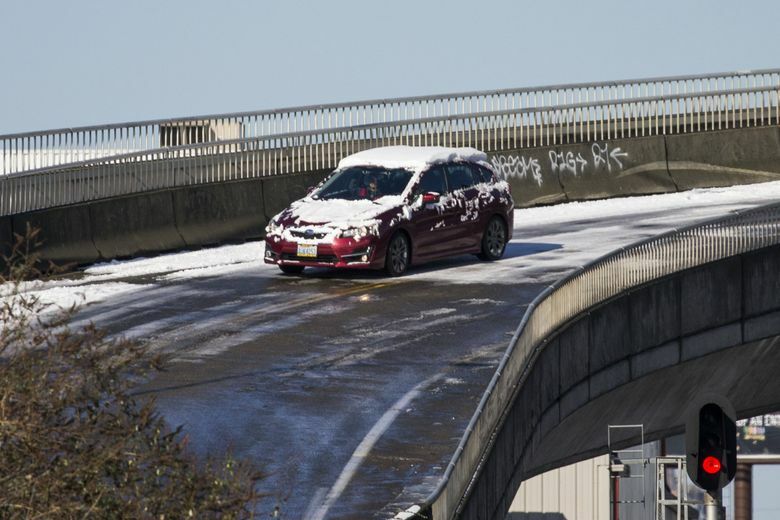 After more than three weeks of avoiding Viadoom traffic or the slick and icy roads of a snowed-in Seattle, there may be some who crack Thursday and decide to drive the car. OK. That’s fine. But be careful and take steps to make sure you and your vehicle arrive safely. Even if your car’s window is frozen and the engine needs a warm-up, don’t do what thousands of drivers across the nation do as a matter of course on cold winter mornings: Turn on the car and leave it running in the driveway with the tailpipes puffing telltale clouds of exhaust into the frosty air. First of all, it’s against the law in Washington and Oregon to leave a car running while unattended. Second, “it’s a visual invitation for car thieves to jump in and drive away,” Seattle-based PEMCO Insurance company said in a list of winter tips. This time of year, the company says they see a spike in “puffer thefts” and don’t want you to be one of the victims. Temperatures in the Puget Sound region are expected to warm slightly during the day on Wednesday and Thursday, perhaps reaching into the upper 30s or mid 40s, said Kirby Cook with the National Weather Service in Seattle. Temperatures were expected to dip into the 20s and below on Wednesday night in many areas and into the low 30s Thursday night and into Friday morning, he said. Though Friday is expected to be mostly dry through the afternoon, Cook said, a second weather system — like the one that came through Seattle on Sunday and Monday, blanketing the region with snow — appears likely to arrive later Friday. Cook said the new system, expected to channel Arctic air from the Fraser River Valley through British Columbia and into Washington, will also bring strong and gusty winds from the north to northeast. Frozen car door lock? Banish ice in a flash with a dab of alcohol-containing hand sanitizer over the keyhole and on your key. (Wipe it up to keep it off your paint.) When you’re back home and if the lock is thawed, spray it with WD-40 to prevent future freeze-ups. Alcohol also can help de-ice your windshield. Mix 1/3 cup water and 2/3 cup rubbing alcohol in a spray bottle and spritz the frost away. You also can spritz the night before to discourage ice from forming. Just be sure to wipe off any overspray so it doesn’t damage your car’s finish. Solid ice on the windshield? As with the frozen door lock, rubbing alcohol also can help clear a windshield without a chisel and scraper. Mix 1/3 cup water and 2/3 cup rubbing alcohol in a spray bottle and spritz the frost away. Be careful to wipe the mixture off painted areas to prevent damage. Prevent your wipers from freezing by covering them with old socks when you park for the night and keep side mirrors clear by slipping a sock, plastic bag or something similar over them and securing with a rubber band or other tie. Unfog the inside of your windows by using an old fashioned chalk eraser to wipe them down. Prevent your door from freezing shut by spraying a little cooking spray, like Pam, on the rubber gaskets around each door to discourage ice. And finally, maybe throw a container of non-clumping kitty litter in the trunk to pour under the tires for traction should you get stuck in a rut. If all this seems like too much work, maybe rethink it all and do what you’ve been doing for the last couple of weeks: keep on walking, busing and taking the train.